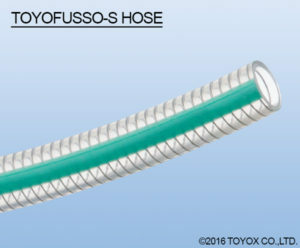 ++NEW++TOYO FUSSO-S Hose SizeΦ32、Φ38 TOYOX « TOKYO BELT CO.,LTD. Applications:For delivering foods, beverages, water and more. Fluids:Oils　Chemicals (including gases, pure water)　Foods (including fats)　Solvents & Paints　Powder　Air　Water, Hot water. [Resistant to collapsing] The SUS 316 stainless steel reinforcing coil provides high form retention for use in pressure feeds and vacuum conveyance. [Resistant to chemicals and solvents] With tetrafluororesin (modified ETFE) on the inner surface, the TOYOFUSSO-S Hose provides excellent resistance to chemicals and solvents that surpasses difluoride resins. [Non-adhesive and repellent] With tetrafluororesin (modified ETFE) on the inner surface, the TOYOFUSSO-S Hose provides great water repellency to efficiently convey fluids. Since little residue becomes lodged inside, cleaning is more efficient. [Flexible and easy to work with] The integrated layer construction makes the hose more flexible and easier to work with than single-layer fluorine tubes. [Flavorless and odorless] With tetrafluororesin (modified ETFE) on the inner surface, the TOYOFUSSO-S Hose does not absorb food odors. [Compliant with Food Sanitation Act regulations] Compliant with the Food Sanitation Act (Ministry of Health, Labour and Welfare Public Notice Nos. 201 of 2006, 267 of 2002 and 52 of 1951) for worry-free performance.